Warning! Before you read this get your cuppa ready cos it goes on a bit! We set off this morning aiming to go and see a salmon ladder on the River Namsen which was just a short distance up the road from where we were parked. Salmon season starts in May here so we were reasonably hopeful that we might see some jumping, however it wasn't to be because the salmon in the river have been infected with a parasite - Gyrodactylus salaris. A sign informed us that although the water had been treated, the whole area was still closed to visitors, and the 🚫 was being enforced by Mr Troll who was guarding the gates. 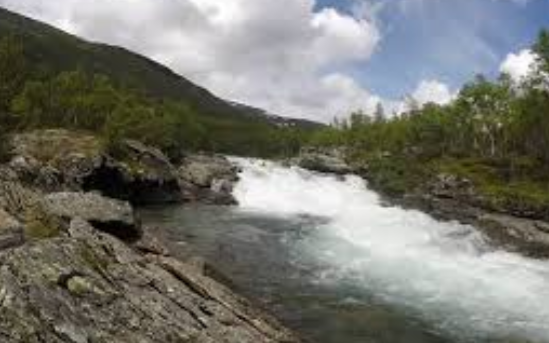 The Namsen is one of the longest rivers in central Norway (228 kilometres) and one where the largest Atlantic Salmon in Europe can be caught - but not this year! Anyway, once that plan had been abandoned we continued on towards the town of Namsos to refuel and collect a few essential grocery items, and very soon after that we pulled into a pretty picnic spot for lunch. Then once we hit the road again we turned off the FV17 and onto Route 715, and if we thought we'd passed along rough roads before, this one took the biscuit!! After about 30 kilometres of being shaken (but not stirred) we came to a section where we were required to leave the road altogether and follow a bit of an unmade track, but as soon as we got onto it a nice young man came and told us the 'road' (and I use that term very loosely), would be closed for a while for essential work to take place! So we switched off our engine and waited, and waited, and waited - I really ought to have made a ⛾⛾! But eventually we were allowed through and happily after a short distance of deep potholes and loose shale the road surface improved, and although it wasn't quite smooth it wasn't too rough either. After that we just rolled on gobbling up some more miles that needed to be put behind us on our journey south - and really I suppose we both became a bit despondent because although the vistas are wonderful, travelling like this can get a bit boring at times - we've covered 6,500 miles now on this tour and we've probably still got at least 2000 more to go! But having said all that, the next few days should be much more interesting because the Atlantic Road, Trollstigen (a road that climbs a mountain), and Jostedals Glacier National Park are coming up! Eventually, today's long journey came to and end - but alas, it had a sting in it's tail. The parking area we'd chosen was JUST under one of the dreaded automatic toll barriers and this one stung us for 81 Nok, (8 quid), and the worst of it was that if we continued on our planned route we would have to go back under it in the morning. Therefore, at this moment John is planning our diversion so that we can continue along Route 715 and thus avoid a double whammy! Mileage 157 from Resteplass at the junction of Route 710/715 to another Resteplass just after the Atlantic Tunnel. This morning we set off along Route 715 to catch yet another ferry from Rorvik to Flakk, and to get there we traversed along the road that we'd paid 81 Noks to use, however after being clobbered for so many tolls here in Norway, (and I'm sure there are still lots more to come) it really makes you appreciate our English system - once you've paid your tax you'r more or less done. After about 30 km we arrived at Rorvik just in nice time to board the ferry, then once we'd been chucked off we mostly followed the E39 to Halsa for our 2nd ferry of the day, but this time we weren't quite so lucky because as we approached we could see it just 'steaming' away. But hey- ho, we only had 20 mins to wait for the next one which swiftly delivered us to Kanestraum! Then it was a case of continuing on along the E39 and then Route 78 for a (long) while before we entered a 6 km tunnel that took us under the Kvernesfjord and on towards The Atlantic Road which is A National Tourist Route and is on the itinerary for tomorrow. However, before we got to tonight's planned stopping place Mrs Snoopy directed us onto Route 64 which dived into another 6 km tunnel which passed under the Bremsnesfjord, and when we popped out of there you'll never guess what dropped on our heads😱😱! Another bloody toll and this time for 138 Nok! 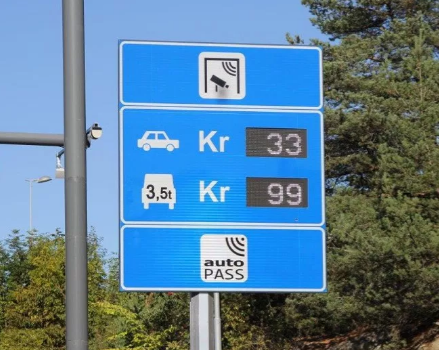 So altogether in tolls and ferries today's total cost came to 1,105 Nok (£103), but that would have been much more if our van had been heavier than 3.5 tons because then the price for tolls sky rockets! We eventually got settled at about 5pm in another lovely spot right on the edge of the water with lots of little islands and skerries scattered about in front of us. Rain has been promised for later so hopefully that will have a freshening effect - but if it continues all night I'll probably be moaning tomorrow about how it kept me awake - some folks are never satisfied!! Well, there was plenty of rain overnight but it didn't really keep me awake, however it did have the lovely cooling effect we'd hoped for - the temperature has dropped from around 30 degrees yesterday to a lovely balmy 22 ish today! This morning it was forwards and onwards to the Atlantic Road which in it's entirety stretches from Bud to Kristiansund but we were really only interested in the 8.3 kilometre section that runs through the archipelago from the island of Averoy to the mainland at Eide. The road, which was opened in 1989 crosses 7 bridges that allow you to hop from one small islands to the next, but probably the most special is Eldhusoya. Here a huge amount of money (50 million Norwegian Kroner) has provided a tourist info building and an elevated walkway that meanders along the ocean side of the island to give stunning views of much of the archipelago and the ocean beyond. The history of the road can trace it's way back to 1909 when vague plans were first made for a railway but that never got off the ground, then in 1935 the planners thought a road might be more suitable but those ideas were shelved as well, and it wasn't until 1983 that work actually started. The network of bridges then took a further 6 years to complete and during that time the workers endured a total of twelve hurricanes. In 2006 the Guardian Newspaper suggested that the Atlantic Road was the World's Best Road Trip - it was really beautiful but the best bits only cover a very short distance so I'm not sure it quite deserves that accolade! Once we left the Atlantic Road behind we continued on our way to catch the ferry from Molde which we managed to nip onto with 2 mins to spare, and from which we alighted at Vestness. 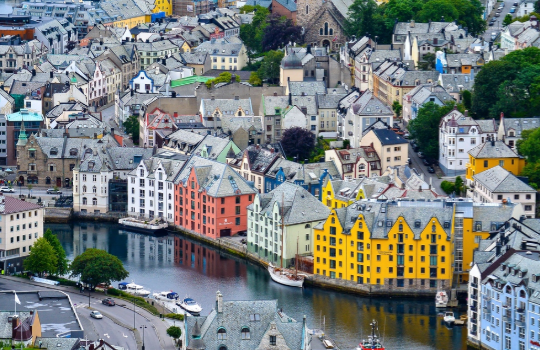 Our next goal was the town of Alesund where we were planning to spend the night in their dedicated waterfront motorhome parking which had 30 odd places, but even though we arrived early at about 2ish there wasn't a single gap! Therefore, we had to be satisfied (like a lot of others) with just parking for 3 hours in the adjacent car park, but in the end that aloud us to avoid the 250 Nok overnight fee, and later we nipped off and found another free spot for the night. Our purpose for going to Alesund was mostly so that we could climb up to the Mount Aksla Lookout, and to get to there we needed to pass through some of the towns busy streets, then into a park area, and from there we climbed a steep zig zagging path before making our way up the 418 steps to the top! But the panoramic views were well worth the effort, and from our vantage point we could look down on the two prison cruise ships sitting anchored in the harbour, and also admire the town that almost looked like a model village but with tiny people scurrying around it's streets. But what goes up has to come down, and although that wasn't quite so challenging on the cardiovascular system it was strenuous on our knees - but the fuss some folk were making was quite hilarious! much of it was in a similar art deco architectural style! After a little more exploring we finally left town at about 5.30 but by that time even more motorhomes had joined us in the car park - and some planned to stay there overnight, however by then we'd decided to head on to Andalnes which would put in a good position for our climb up the Troll's Road tomorrow! To get there we still had 70 miles to go - first along the E 136 and then Route 64, and along the way we enjoyed more mountainous vistas, and we also managed to incur more tolls! The first was for the Tresfjord Bridge which has a span of 1,290 metres and was opened in 2015, and the second was for the Vagstrands Tunnel. 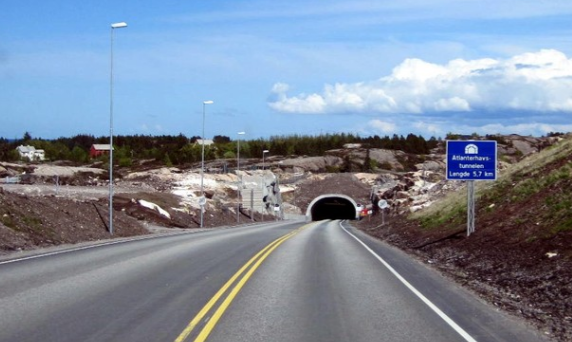 The tunnel is 3,665 metres long and was completed in 2014. 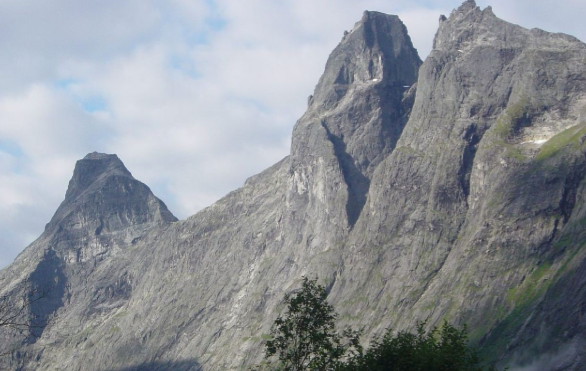 It climbs from 10 metres above sea level to 50 at it's highest point, and the stone pulp that was blasted from it's core was used in the construction of the Tresfjord bridge. 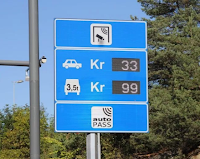 The cost for the tunnel alone was 500 million Nok and the toll will run until that sum has been recouped - so my guess would be - for a very long time yet! As usual John had identified a parking area where we could spend the night, and for today it was beside the Romsdals Fjord, and although it was quite busy with other vans when we arrived there was still plenty of space for us! However, this time we didn't quite manage to secure a water side seat - but it's free and after all the hussel and bussel of the parking in Alesund we're quite glad to be here! This morning we were on the road before 9am which is unheard of for us unless we've got something to catch 🚢, but this morning it was more about something we wanted to miss - and that was any tourist coaches coming down the Trollstigen Route as we were trying to get up! And on this part of our journey we achieved our objective, but later was a completely different story! Today's route was to follow Route 63 which is part of the Geiranger Trollstigen Tourist Route that runs for over 100 kilometres, and for nearly all it's length it's been tortuously shaped by glacial activity during the last Ice Age. Our journey started with a 17 kilometre climb up a mostly single track road to nearly the top of the 'Troll Ladder' pass. The first 3 km were fairly flat but after that the road started to ramp up at a gradient of 10% and the first of the 11 hairpin bends appeared. From then on they came in quick succession as the road twisted upwards, and one of them turned us onto the Stigrora bridge where the road is carved into the mountain side and supported by stone walls. 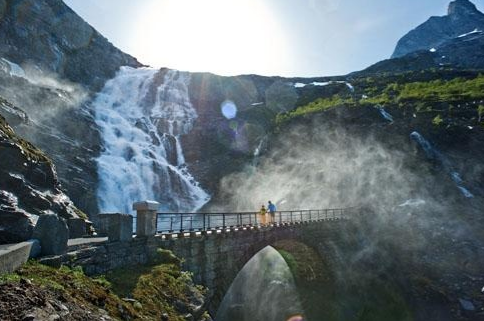 The bridge carries the road across the stunning and mighty Strigfossen waterfall, which on the bends almost invades your very own personal space! We reached the 'top' (which wasn't quite the highest point) at about 9.50 am and at that time there weren't many others there so we could really enjoy the walkways and almost deserted viewpoints from where we could see all the way down the mountainside. 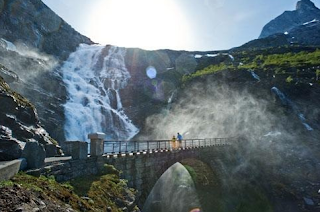 The largest viewing platform juts out over a ledge and hovers 200 metres above the Trollstigen road, thus you can see exactly what you've climbed and you can also watch others making the same journey! However, within about half an hour of us being there the coaches started to arrive and the hordes descended, but by then we'd snapped all our pics and closed our mouths after being gob smacked by the stupendous views, so we left the crowds behind and retired back to T4rdis2 for a late breakfast. But it was at that point that we found we'd got new lodgers cos the pair on the right seemed to have moved in while we weren't looking - but we decided that because they won't take up much room they can stay! Once back on the road we still had a bit more climbing to do, and initially as we went over the top we had to play dodgems because there were parked cars - many of which were in the passing places, several coaches and lots of dozy sheep littering the road! But we both quickly agreed that this side was definitely a bit easier - maybe we wouldn't have been quite so cocky if we'd known what was to come later! However, the views continued to be awe inspiring with lots of untamed towering mountains where huge boulders had sheared off and tumbled to the slopes below, lots of glacial lakes and also glacial tongues that peaked down at us from high above. We later learnt that we'd also seen The King, Queen and Bishop at that point along with 'The Trolls Wall' Romsdalshorn and Alnestind! The River Valldala also kept us company on our way down and it's almost blue ice melt water tumbled and gushed over small falls eliciting several oohs and ahhs from me - but John missed most of that because he was concentrating on other things! The pass came to an end at the town of Valldalen but from there we continued on along Route 63 to catch another ferry from Linge to Eidseal. Now, ferries have become quite an expensive item for us (nearly £500 in Norway so far) because for each extra metre above 6 the charge goes up by a big chunk. However, on the last 2 we've got away with only being charged the 6 - 7 metre fee (despite the fact that we're 7.5 metres)! The first time I just told the conductor that I'd prefer to pay the lower rate, and the second time I told him we were 6 metres and a BIG bit 😂😂! Once off the ferry we headed towards Geiranger Fjord, and this turned out to be another winding twisting hairpin bedecked section of road that took us through more snow capped mountains and on to a parking area high above the tip of Geiranger Fjord. And as we looked down from our vantage point we could see Cruise ships and car ferries waiting to take passengers along the fjord itself. The whole area is listed with UNESCO and it was easy to see why - this was easily the most dramatic fjord we've seen so far, and for a high price we could have taken another ferry to sail along it but we decided to save our money and take the road instead! Therefore, from our lofty perch above the fjord we started our decent down to the port, but here the road became quite steep again and there were more hairpins hiding as it dropped. And this was where we met 3 coaches, 2 cars and a taxi which had come to a bit of an impasse - happily we were far enough back to just sit and watch as they shunted back and forth with only inches to spare! Then, once everyone had sorted themselves out my lovely husband decided to play a joke - he screeched 💣BANG which caused me to nearly jump out of my skin! After I'd recovered I told him I didn't think he was funny - but I had to laugh! When we got to the bottom of the hill he also commented about the perfume of brake discs - but thankfully that wasn't coming from us! The 64 then took us through the very busy Port at the tip of Geiranger Fjord and this was were the road started to climb for the 3rd time. Once again it was very narrow but here it was also strewn with hikers and sightseers from the Cruise ships so the situation could only really be described as treacherous! However, with a little common courtesy it was quite manageable, but unfortunately not everyone has this very desirable trait as proven by one of the motorhomes coming towards us! The gap that he was driving towards (at the side of us) just wasn't big enough for him to pass and he could easily have waited where he was for a second or two to allow us to pass him, but he just kept on rolling towards us which resulted in my shouting and gesticulating at him while trying to grab our already poorly wing mirror! Luckily I managed to pull it in just in time and no more harm was done to either van but what John called him is quite unprintable! He had to shunt several times to get round! This part of our journey was definitely the most challenging and much more technical than what had gone before - it certainly wouldn't be suitable for a faint hearted or inexperienced driver! We continued to climb slowly often having to squeeze in for what seemed like dozens of coaches coming in the opposite direction, but as we neared the top of the mountain we realised why. There is a view point called Daisnibba Utsiktspunkt right at the very top, but just before you get there the road splits to allow you to either go up to the viewing platform (for which you have to pay a toll), or to start you decent. All the coaches were obviously sightseeing ones from the cruise ships because they all went that way, so because of the obvious over crowding we did the opposite and started going down the other side! Then once we got to the very end of route 63 we found a perfect wild camp site in another Resteplass. It overlooks a small lake and has waterfalls gushing down the mountain so from our windows we've got lovely views. Therefore, T4rdis2's ignition keys were quickly hung up for the day and the kettle was soon steaming! T4rdis2 loves the free places! The start of today's trip along Route 15 presented itself in much the same way as yesterday! However, the main difference was that the first 15 kilometres were almost completely underground as we traversed through 4 separate long tunnels that hardly allowed us to come up for air! The narrow dark tunnels swallowed us up into their gloomy interiors, but just before entering them we caught glimpses of the mountains through which they burrowed - and to say they reached skywards was an understatement. Anyway, once we could see the light of day more steep slopes, hairpin bends and waterfalls presented themselves as we headed for the town of Stryn to do some much needed shopping. Once our restocking was complete we continued our journey alongside the green waters of Nord Fjord as we headed first towards the town of Leon which is right at the Fjord's tip, and then on towards Melkevol Bretun Camp Site where we're going to have some down time from travelling for the next 4 days. It's a wonderful place but I'm not going to tell you about it now cos this blog is quite long enough already - mostly due to lack of wifi connection over the last few day!